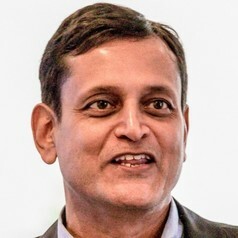 Venkatesh (Venky) Shankar is Coleman Chair Professor of Marketing and Director of Research at the Center for Retailing Studies, Mays Business School, Texas A&M University. His areas of specialization include digital business, marketing strategy, innovation, retailing, international marketing, and pricing. He has been recognized as one among the World’s Most Influential Scientific Minds by Thomson Reuters and as a Top 10 scholar worldwide on innovation. He is a winner of the AMS Cutco/Vector Outstanding Marketing Educator Award for lifetime contributions to marketing, the Lifetime Achievement Award in Retailing from AMA, the Mahajan Award for Lifetime Contributions to Marketing Strategy from AMA, the Distinguished Alumnus Award from IIM, Calcutta, the Distinguished Alumnus Award from IIT, Kharagpur, the Clarke award for the Outstanding Direct and Interactive Marketing Educator, the Long-term Impact Award for an IJRM article, the Green Award for the Best Article in JMR, the Lehmann Award for the best dissertation-based article in an AMA journal. He is co-editor of the Handbook of Marketing Strategy and author of Shopper Marketing. He has published in the JMR, Management Science, Marketing Science, JM, SMJ, HBR, SMR, JPPM, and JR. The Shankar-Spiegel Award is named in his honor. He is ex-President of the Marketing Strategy SIG, AMA and serves on the CMO council and B2B Leadership Board. He was also a two-term Academic Trustee of the MSI. He is editor emeritus of the Journal of Interactive Marketing (JIM), associate editor of JMR, Area Editor of JM, and ex-associate editor of Management Science. He serves on the policy boards of JR and JIM and on the editorial boards of Marketing Science and JAMS. He is a three-time winner of the Krowe Award for outstanding teaching. He has been a visiting faculty at MIT, INSEAD, Singapore Management University, SDA Bocconi, Chinese European International Business School, and the Indian School of Business. He was selected as the 2014 Guru to deliver the Guruspeak lecture across India. He is a Research Fellow of Northwestern University’s Retail Analytics Council. Venky has a Ph.D. in marketing from the Kellogg School, Northwestern University.